Onion pakoda must be one of the favourite evening snacks for most of us.We generally make it using gram flour & rice flour.For a change,i tried it adding our homemade mixed millet flour/Millet sathu maavu powder.It came out really crispy and flavourful.Raksha & Sendhil liked it very much.I was also happy that i could give them a healthy deep fried snack using millets.And now i am typing this post munching these crispy pakoras,its yumm .Friends,Try this snack recipe for your family & enjoy with evening coffee or Tea. Check out my other millet recipes here ! Wash and slice big onions thinly.Wash and chop ginger,green chillies,mint,curry leaves,coriander leaves & set aside. In a wide bowl,take all the ingredients except cooking oil and ghee.Mix all the ingredients well without adding water.Onions will leave water while u mix.So mix everything together. Heat oil to deep fry.Take a tbsp of hot oil and add to the flour.Add ghee.Mix well.Then sprinkle few drops of water and make a dough. Put a drop of batter & check the heat of oil.If the batter comes up immediately,oil is ready.Reduce the flame to medium high & pinch in a portion of batter and drop in the oil in a sprinkled manner. Cook till onions turn golden brown.Remove in a tissue and enjoy eating hot with tea ! Gram flour is used for binding and rice flour for crispiness. You can follow the above recipe and make pakodas with kambu maavu or thinai too. Hot oil is added to give crispy pakoda.Don’t skip it.Ghee is for softness. Enjoy this crispy millet onion pakoda with tea/coffee ! Tastes yum !! Last month i shared our homemade mixed millet flour/energy mix powder/sathu maavu recipe here.Using that flour,i have shared an instant sathu maavu dosa recipe too.Recently i tried sweet & savoury porridge/kanji using my millet energy mix powder for our Sunday breakfast.It came out really well and it was flavourful too.Making this millet porridge is just a 10 minutes job.You can try sweet or savory version based on your liking.If u have less time in hand to prepare your breakfast,this millet porridge is an easy & healthy option with health benefits of all the millets in one dish.Its one of the ideal recipes for weight loss too.It keeps u energetic and full.Do try it n let me know your feedback .If u don’t want to make millet powder on your own,u can also buy the organic millet powders available in stores and prepare this porridge.But homemade millet powder is economical always ! You can try this porridge for one year old babies too.But keep in mind,u should add just 1 tsp of this powder for 2 cups of water,make it really watery and give them for the first time.If it suits them,u can increase the quantity of powder gradually.Check out my millet flour ladoo/Sathu maavu urundai recipe using jaggery if interested ! Last week when i went to Salem,my MIL gave me dry roasted & ground kambu maavu/Pearl millet flour and mixed millet health mix powder/Sathu Maavu.My MIL suggested me to try this Kambu sweet puttu with the flour.I tried two versions adding Jaggery and sugar.Both came out very well n tasty.I also made Kambu kanji/pearl millet porridge( savoury version) along with it which i will post soon.We had a healthy,hearty breakfast yesterday.Here are some of the health benefits & names of pearl millet in other languages for your reference.Pearl millet is called as Kambu in Tamil , Bajra in Marathi,Gujarati,Rajasthani,Sindhi,Punjabi,Sajje in Kannada,Sajjalu in Telugu and Kambam in Malayalam.Coming to its health benefits,Pearl millet is a miracle millet which has iron that is 8 times of rice.It is very rich in Calcium,Protein,Iron & Magnesium.It helps to reduce the bad cholesterol level in our body. Its a great body coolant.Its consumed as porridge during summer.It helps to improve the digestion power & heals stomach ulcers too.It helps to improve bowel movements & prevents constipation.It makes our body strong.It helps to increase the secretion of milk for lactating mothers !.Do try this healthy kambu maavu puttu recipe for your breakfast or as evening snacks.U will love it like us.I preferred jaggery version more than sugar version.Try any based on ur liking ! Take the kambu maavu/Pearl millet flour in a wide bowl.Mix salt in little water and sprinkle it in kambu maavu.Mix well.Add water such that u should be able to shape it roughly as shown in the picture. Now spread this kambu maavu in idli plate and steam it for 10-15 minutes till the color of flour is changed.Remove the idli plate and take the cooked kambu maavu in a mixie jar.Grind once or twice to powder it because as u steam the flour,there may be lumps formed.So we are grinding the steamed flour to break the lumps. Take the ground flour in a bowl.Add sugar,cardamom powder & grated coconut.Mix well and serve.If u want to add jaggery,proceed to the next step. Melt jaggery in a bowl adding little water.Strain the syrup and again boil till it starts to become thick n frothy.Switch off the flame.Add cardamom powder and mix this syrup with the cooked & ground kambu maavu.Add the required amount of syrup and mix well.Lastly add grated coconut,mix well and serve. NB: I felt jaggery puttu was very soft than sugar puttu.So make it as per your taste.If serving immediately,u can try sugar puttu else make jaggery puttu because it stays soft n good even after an hour.You can also make spicy version by sauting onions,chillies,ginger & curry leaves in little oil.Temper and mix everything with the cooked flour. ** For making homemade kambu maavu – Dry roast kambu/Pearl millet in a wide kadai in medium flame till it starts to splutter and leaves a nice smell.Do it in batches if u want to make in large quantity.Roasting takes nearly 7-9 minutes.Do not burn them while roasting.so pls be careful.After roasting,switch off the flame and allow it to cool.Grind in a mill OR Mixie for small quantity.Sieve if necessary,spread in a news paper to cool down the flour and store in an air tight box. Do not sprinkle too much of salt water.It also makes the puttu hard.At the same time,if u add less water,puttu will become dry. Though sugar puttu is easy to make when compared to jaggery puttu,jaggery puttu was softer than sugar puttu.But taste wise both were very good.So make it according to your choice. You can also try savory puttu.Just refer my ragi spicy puttu and follow the same directions. Try this healthy kambu puttu for breakfast or snacks.It tastes yum ! Wash and soak the thinai/Foxtail millet for 2 hours.After 2 hours,grind it to a slightly coarse paste adding cardamom & little water.To this,add wheat flour,rice flour,Chopped Banana,grated jaggery,grated coconut and grind to a smooth thick paste adding required water.Batter should be of pourable consistency. Leave the batter for 2-4 hours.Before making appam,add a big pinch of cooking soda and mix well.Heat paniyaram pan and add a tsp of ghee in each hole.Pour a small ladle of appam and cover cook it for few minutes in medium flame.Flip it and again cook for a minute.Remove and serve hot ! Adding rice flour is optional.This appam itself comes out slightly crispy outside and soft inside. U can also add rave in place of rice flour. Adding cooking soda and banana is essential.It gives u the soft appam.Suppose if u ferment the batter for 8 hours,then cooking soda is not needed. Serve & eat hot to enjoy its best taste. Make this healthy,Lord Muruga’s Favourite Thinai Nei appam for this Karthigai Deepam and get his blessings ! Very recently i started making upma & pongal varieties using millets.I tried Ven pongal using Varagu arisi( Kodo millet in English,Koden/Kodra in Hindi,Harka in Kannada,Arikelu in Telugu,Koovaragu in Malayalam- Source-Wikipedia) for the first time.It came out very well.As u all know Varagu rice/Kodo millet has amazing health benefits.It is basically a digestion friendly millet.It is rich in phytochemicals,Phytate that helps in reduction of cancer risks.It helps to reduce the body weight which is most needed for obese people.It helps to overcome irregular period problems in women.It helps to reduce knee & joint pains.It is good for diabetic people.It reduces nervous disorders especially in eyes.And this pongal is a very easy and tummy filling breakfast recipe.Just 1/2 cup of varagu arisi is enough to serve 2-3 people because it doubles in quantity once its cooked.It tastes very similar to our regular rice pongal with full of flavors.My daughter Raksha loves pongal a lot.When i gave this for her breakfast today,she couldn’t identify its varagu rice pongal and not our usual one .We had with coconut chutney as side dish.It was yum .Do try this easy and healthy pongal recipe for your breakfast or dinner.I am sure your entire family would love it. check out my other millet recipes here. Varagu arisi pongal recipe - Healthy millet recipe for breakfast ! Wash the kodo millet ,drain and set aside.In a pressure cooker base,heat ghee and add the moong dal,pepper corns.Saute for a minute in low flame.Make sure the color of dal should not change.Then add the cumin seeds/jeera and saute till it turns light golden.Lastly add the curry leaves,green chillies & hing.Stir it.Add the measured water and required salt. Add the washed & drained millet and ginger pieces.Close the cooker and cook for one whistle in low flame.It will take nearly 10-12 minutes. Remove the lid and mix well.Add a tsp of ghee and serve hot !Tastes the best with coconut chutney ! Serve this pongal when its hot to enjoy its best taste.When it cools down,it will become slightly hard.You can reheat the pongal while serving by adding little water and mix well in high flame for few seconds. You can follow the same method and make pongal with thinai & samai too. But the quantity of water may slighty vary. Here I used 1: 5 ratio of millet and water. You can use 1:4 too. Replace ghee with cooking oil if u are calorie conscious.But ghee gives great flavor. Add a tsp of ghee while serving for kids. 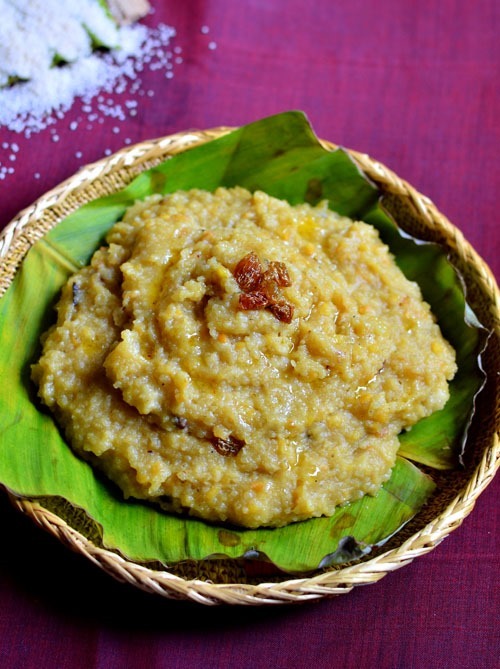 Serve this healthy,easy varagu pongal with chutney and sambar.Tastes yummy ! Last week i shared instant millet dosa using mixed millets energy mix powder.Though i make it very often,i wanted to try a dosa recipe with kambu (in tamil)/Pearl millet ( in English)/Bajra(in Hindi) as i got tempted by seeing my fellow bloggers post.Recently my friend Shalini was telling me about kambu dosai which she has been making for her breakfast regularly.So I took this recipe from her and tried today for the first time.She told me to use brown rice and pearl millet but i used raw rice as i din’t have brown rice in stock.So feel free to use brown rice instead of raw rice in this recipe.You will get good results and its a healthier option too.I will try to post kambu adai and kambu koozh recipes soon.Lets see how to prepare this kambu dosai for breakfast/dinner.This dosa tastes the best when it is served hot.It becomes slightly chewy when its cooled down but overall its a very flavorful and healthy breakfast recipe.Check out my other millet recipes below. Types of millets with health benefits,other names,where to buy etc. Wash and soak the kambu,rice,urad dal and methi seeds together for 2-3 hours.In a big mixie jar,take half of the quantity of soaked grains and grind it adding ice cold water(It helps the mixie jar to prevent heating). Grind it to a smooth paste adding enough water and salt. (I used the soaked water itself).Transfer the batter to a vessel. Let the batter ferment over night or for 10-12 hours.The next day morning batter would have raise well.Mix it well and check the consistency.If it is too thick,add little water say 1/4 cup and mix well.Heat dosa pan and pour a ladleful of batter.Spread it well if u want to make thin,lacy dosas OR spread it little if u want thick soft dosas.Make it as per your wish.Drizzle a tsp of oil and cook for a minute.Cover it with a lid and cook the dosa if u want crispy ones.Do not flip the dosa.If u want thick dosas like utappam,flip the dosa and cook for a while.Remove and serve hot. Enjoy with your favourite chutney.I served it with coconut chutney and idli podi ! Use enough water while grinding the batter.Batter has to ferment for 10 hours minimum in cold weather.If the climate is hot,this batter will ferment quickly and it will become sour.So keep an eye. Use brown rice instead of raw rice.U can use idli rice too. If u don’t want to use rice at all,just follow 2:1 ratio of kambu & urad dal and grind the batter as mentioned above. This dosa becomes soft when its cooled down.So serve n eat hot ! Few weeks back i shared millet energy mix powder/siru thaniya sathu maavu podi.You can find that recipe here.This millet powder is very useful & handy for us.We use this powder for making instant dosa & porrdige for our breakfast and dinner. It comes out very well with awesome flavours of millets.Every month my FIL buys 1/2 kg in each variety of millet & grind in a mill.We store and use that powder for 2-3 months and make dosas regularly and porridge during fasting days.My MIL usually says, instead of searching for different recipes with each millet,she is very much comfortable and happy with this mixed millet powder as it includes health benefits of all the millets in one recipe.Nowadays i too started making this dosa very often in my kitchen.Friends,if you got bored of making idli,dosa,pongal,upma and rice recipes with millets,do try this sathu maavu /health mix powder for a change.You will love it for sure.OK,Lets see how to make this easy,instant mixed millet powder dosa. Add this to the batter and mix well.Check for salt. Batter should be slightly watery.Heat dosa pan and pour the batter in a circular manner starting from outwards towards center.Fill the holes with little batter. Adding rice flour & curd is optional here.Instead u can add a tbsp oof ragi flour for easy removal of dosa. If u want to make thick dosas,add little water & make dosas thick.For thin,lacy dosas,add more water & make the batter watery.But adding too much of water makes the dosa look dry.So take care. Also if u don’t have time to have saute onions,just add pepper corns and jeera to the batter and make dosa.It also tastes equally good. I am in the phase of trying varieties of millet recipes now.I have tried thinai idli,mixed millet sathu maavu,millet ladoo so far & shared the same here.Varagu,samai & kuthiravali recipes are in my try list for long time.To start with,i tried this samai sweet pongal recipe / Samai sakkarai pongal. Today being Navratri friday,i made this samai sakkarai pongal for my vilakku pooja.It tasted yummy.U can follow the same recipe & prepare varagu arisi pongal too.Soon i will share ven pongal recipe using varagu & samai here.To check out the health benefits of millet,their availability in Bangalore and for more informations with pictures,please click this link. Wash the samai,drain n set aside.Heat n melt jaggery adding little water to cover it.After the jaggery is melted,strain the syrup and take it in a bowl. In a pressure cooker base,heat a tsp of ghee and roast the moong dal for a minute till u get a nice smell.Add 2.5 cups of water and the washed samai to it.Add a pinch of salt and pressure cook in low flame for one whistle.After the steam is released,open the cooker and add the jaggery syrup.Mix well and let it boil for a minute in low flame.Add 2 tsp of ghee at this stage to avoid burnt bottom.When the pongal starts to leave the sides of cooker,switch off the flame.In another pan,heat the remaining ghee and roast the nuts,cloves and add to pongal. Add a pinch of edible camphor and mix well ,serve ! U can replace samai with varagu too.But adjust water accordingly. No need to roast samai.U can also do it along with moong dal if necessary. Make this healthy samai sweet pongal and offer God !